Origin Windows are built to withstand the weather, while blending in with the style of almost any Derbyshire home. Kedleston Windows will fit your made to measure windows without error, so you can buy from us with peace of mind. We searched the market carefully for a manufacturing partner that would meet our quality standards. We found the perfect match with Origin – leader in their particular field. Origin Windows perfectly balance stylish aesthetics with market-leading performance. Find out more by calling or emailing our team today. You can also get an online quote in less than five minutes by using our window design tool. 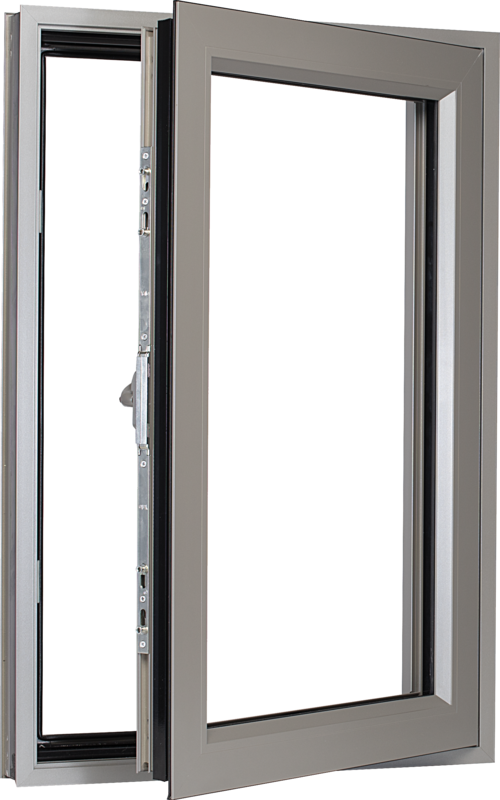 Our Origin windows are manufactured using only high end aluminium. Our units are designed and tested to ensure long-term structural integrity. Additionally, our double glazing is light in weight, which results in a slim design that produces enviable sightlines. Enjoy the benefits of an aluminium window that looks outstanding and which will protect your home in Derbyshire from the weather. Filling your rooms with lots of light is one of your design objectives. Our Origin Windows exhibit fine sightlines, because the edges can be placed as little as 50mm away from the glazing. The thermally efficient designs of our units will make sure your property is comfortable 24/7, while helping you to reduce energy costs. Choose Kedleston Windows as your installer in Derbyshire. The contemporary designs of our Origin Windows make them the perfect choice for modernisation projects or new-build homes. Add a touch of minimalist style to a traditional home to create an interesting contrast that will catch people’s attention. Complete your Derbyshire home improvement project with aluminium windows that deliver performance where its needed. Our Origin windows are weatherproof, built to retain heat and keep unwanted visitors out. Call or email our team today. Enjoy the advantages of a 20 year guarantee that will let you buy your Origin Windows from us with complete confidence. Each unit is carefully and thoroughly tested to ensure it delivers exceptional performance. Your new double glazing will repay your investment over time. No two windows that we install ever look the same. That’s because every customer we work with in the Derbyshire area has a different requirement. Customise your installation using your preferred colour or finish and select from our portfolio of hardware, glass and accessories. Origin Windows use Yale technology to keep intruders out. Built to meet PAS 24 requirements in full, our products will protect you from almost any unauthorised attempt to break into your property in Derbyshire. Curious? Find out more by calling or get an online quote in minutes. Wooden windows often warp or flake. Aluminium doesn’t suffer from this problem. It’s also much lighter than steel – 67% lighter in fact, but without making any concessions when it comes to strength. Get the perfect balance when you buy an Origin Window from us today. Invest in the best with an aluminium window professionally installed in your Derbyshire home by the Kedleston team. Your fully customised units will blend in with the style, age and size of your property and improve its market appeal and value in the long term considerably. We understand how important price is to our customers. The homeowners we work with often assume that stylish aluminium windows are far too expensive and discount them. In fact, our double glazing is surprisingly affordable and a long-term investment. Choose Kedleston Windows as your preferred installer and enjoy first class service. From the moment you call us with your enquiry, through to the installation of your product and beyond, we’ll keep in contact with you to ensure you’re satisfied with everything. Enquire today by calling or emailing us for more information. If you are in a rush and need an Origin Windows quote for your project, visit our design tool. Create your product on a mobile, tablet, laptop or home PC within a matter of minutes for most of our products.